Ford Engineering are capable of producing a wide array of pressed components, ranging from simple punching and blanking of washers, spacers, gaskets, core plugs and similar products through to high volume double die production of aerospace standard components. The press capabilities incorporate a combination of both hand presses and power presses, allowing for the production of very small batches through to large production runs, to suit the customer’s needs. This pressed plate is an assembly of three components. It incorporates a solid plate which is punched from a sheet, as well as two additional pressed components. These parts are treated, painted and part-marked as per the customer’s specifications, providing a high quality finish which will be visible when used in the final product. 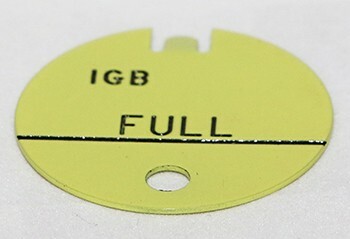 This oil level indicator is initially pressed from sheet material as a blank, using our dedicated aerospace presses. The profile and text is milled onto the face of the blank due to the importance of its positioning, which could not be achieved using other manufacturing methods. 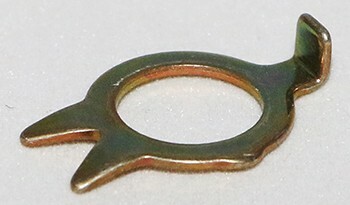 The indicator is then sent out for plating and painting to protect the component during its operational life, as it will be constantly immersed in oil.